When Stranger Things first landed on the scene in 2016, we all had a lot of questions. Where did Eleven come from? What’s a Demogorgon? How does Steve get his hair so exquisitely feathered? 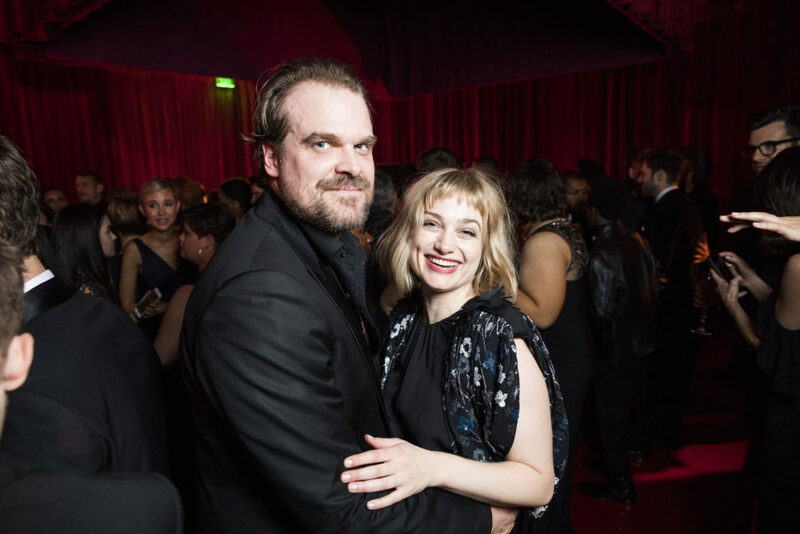 But there was one element of the show that was perfectly clear: Basically everybody wants to date Hawkins Police Chief Jim Hopper, aka David Harbour. And it looks like one lucky lady *might* already be dating him. Harbour arrived at the Golden Globes Sunday night with Alison Sudol, otherwise known as Queenie Goldstein from Fantastic Beasts and Where to Find Them, and otherwise otherwise known as musician A Fine Frenzy. While we don’t know if the two magically inclined actors are *actually* dating, photos from the event made them look pretty cozy. We do know the pair reportedly attended the ceremony, the Netflix afterparty, and the BAFTA Tea Party in L.A. (the day before) together. But their social media accounts, alas, don’t give us any extra hints about whether we’re talking about something official. Sudol doesn’t appear in Harbour’s “loser” Instagram post after his Golden Globes category was announced (but that makes sense), and there’s no mention of Harbour on Sudol’s mostly music-focused Twitter feed. If there is a love connection between Harbour — who was previously linked to Julia Stiles in 2012 — and Sudol, making their first major public appearance together on the red carpet is a pretty big step. And together or not, the internet is buzzing about whether the two are dating. So how does the other most important lady in his life — Eleven — feel about all this? One could argue she’s taking it well, as an attendee caught a sweet moment between Harbour and Millie Bobby Brown at the show. Could it all be related??? David Harbour has said Season 3 of Stranger Things will explore Hopper and Eleven’s relationship in a more complex way as the telekinetic girl becomes a telekinetic teen. And who knows, maybe Eleven will have a fellow super-powered lady in Sudol visiting the set this time around.